I never thought I’d say this, but the Natural Elements range at ALDI is actually alright. Okay, it’s not great, but it’s a huge improvement over their Julius range. It’s important to consider the good points and bad points of this cleverly formulated food. I’ll explain a number of real truths behind the ingredients, which as with most pet foods reads better than it is. Make sure you absorb both before deciding whether to feed this to your dog or not. First off, the guaranteed analysis is better than most. Protein of 28% is higher than average, as is fat at 18%. That gives an approximate 36% carbohydrates which is better than most other supermarket brands. The food is also at the cheaper end of the scale at around $12 for a 2.5kg bag – that makes it somewhat affordable for those on a tight budget. The main ingredient is Poultry Meal. They say it’s a source of chicken, but how much chicken we don’t know. Ambiguous ingredients are often poor quality (which is a cert given the price per kilo of this food), and this could be a combination of whatever “poultry” is cheapest. 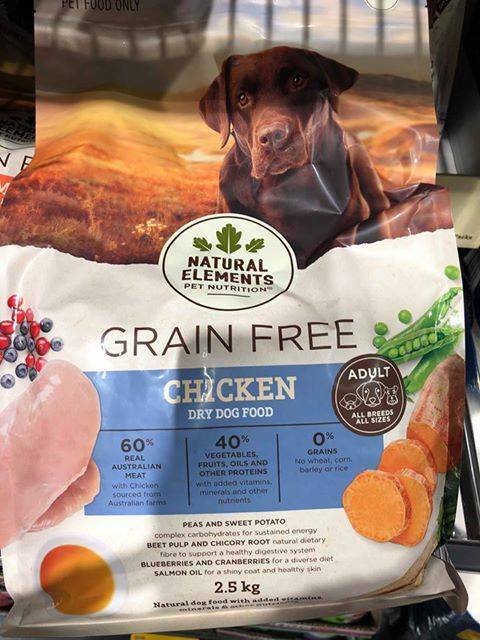 It definitely won’t be the succulent chicken breast pictured on the bag, but remnants of poultry inclusive of frames and whatever can’t be sold for human consumption. This is the case with most pet foods by the way. The second ingredient (likely of an equal quantity to the poultry meal) is Peas. Peas are a cheaper way of bulking up protein and adding fibre than meat. It’s not necessarily a bad ingredient but there are concerns about excessive peas in a canine diet. This is one of the reasons we recommend rotating foods or supplementing a diet with fresh ingredients. The third ingredient is Poultry Tallow which is rendered poultry by-products. It’s a cheap product as it’s a way of recycling and selling meat waste. It’s found in a lot of pet foods and will be a significant constituent of the 18% fat. On the label it says it contains rosemary extract as a natural preservative, but also antioxidants. These will be chemical antioxidants to extend shelf-life, and chemicals in a pet food are never good. We find a trifecta of carbs – Tapioca, Potato, and Sweet Potato. It’s probably better to have a mix, and it’s nice to see they haven’t been used excessively in the formula. 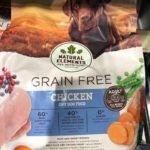 Too much carbs are bad for dogs, and as said earlier this food has lower carbs than other supermarket offerings. Gravy is more likely animal or poultry digest, a broth from rendering meats. It’s a cheap ingredient which is why so many manufacturers list it ambiguously as gravy or natural flavours. We find glucosamine and chondroitin, as well as salmon oil and coconut oil. These will be beneficial for joint health and well-being, but likely included due to the poor quality of meat and meat fats. Taurine (an amino acid found in meats) has been added for a similar reason. We find a range of trace fruits and veggies such as alfalfa, cranberries, and blueberries. These are good ingredients but as trace amounts they’re probably included more because they look good on the label. So there you go, an insight into ALDI Natural Elements. The review probably reads more negative than positive, but it’s still a better food than the likes of Julius. If you have a tight budget then this could be a suitable option, and it’s worth supplementing with fresh meats and veggies (which are often reduced at the local supermarkets). Rated 3 stars as it’s a reasonable budget option. * Carbohydrates are listed on this product as maximum 15%. Poultry Meal (Source of Chicken), Peas, Poultry Tallow (Contains Rosemary Extract, Antioxidants), Tapioca, Potato, Sweet Potato, Gravy, Vitamins & Minerals, Beet Pulp, Salmon Oil, Vegetable Oil, Chicory Root, Yucca Schidigera Extract, Coconut Oil, Alfalfa, Blueberries, Cranberries, Pumpkin, Parsley Flakes, Chondroitin Sulphate, Glucosamine, Rosemary, Taurine, Kelp Meal, Beta Carotene.